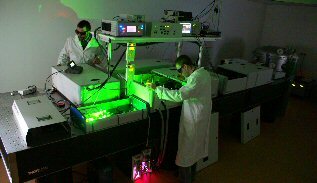 At the beginning of the year 2009 a high power Ti:Sapphire laser was installed in our laboratory. The amplified system Pulsar20 (Amplitude Technologies) provide 10 Hz pulses with 22 fs pulse duration and max. 450 mJ pulse energy. The system is used for high harmonic generation, X-ray laser experiments, plasma experiments, high power pulsed lasers development and experiments. The system is able to output beams from the oscillator (80MHz) and from each of the amplification modules (10 Hz) at different energy level. Experiments with a femtosecond laser at microJules energy level and 2KHz repetition rate are done with a CPA system (Clark-MRX 2101). The amplified output beam is at 775 nm wavelength, with 200 fs pulse duration and the max. pulse energy is 0.7 mJ. or two-photon photo-polymerization of photoresists for 3D micro-structuring, development of a multipulses laser for pump-probe experiments. An additional output from the oscillator of the CPA offers femtosecond laser beam at 35 MHz for ultrafast laser spectroscopy. 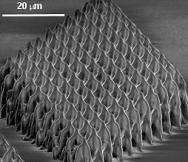 flash and diode pumped solid-state lasers, laser microchip based microlasers, amplified solid-state lasers. diode pumped microlaser, amplified in a multipass configuration up to 20 mJ pulse energy at 1-10 Hz. The laser can provide output beams at 1064, 532, and 266 nm, with pulse duration of about 450 ps. 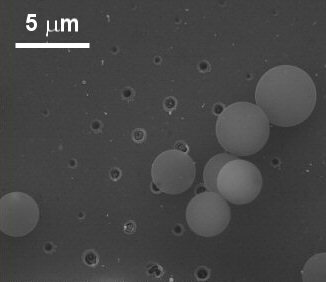 Laser near-filed nanolithography on monodispersed colloidal nanoparticles deposited on gold thin film. Laser wavelength l=532 nm. Pulse duration t=450 ps. 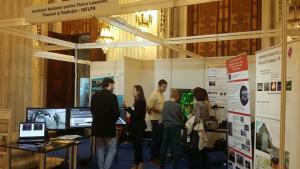 During the recent research projects we developed a microscope for Laser Direct Writing. Coupled with our femtosecond lasers, the microscope is able to produce by laser ablation any computer designed structures with submicrometer resolution on various materials. 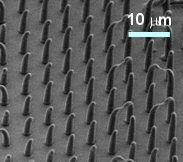 Laser induced forward transfer (LIFT) is an other method to direct write microstructures using semiconductors, metallic films, or even biological tissues. We successfully tested the two-photon photopolymerization (TPP) technique on photoresist using two different high repetition rate femtosecond lasers (the attenuated CPA laser at 2 KHz, and a femtosecond oscillator at 80 MHz). 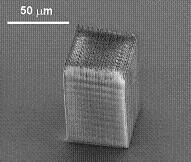 The software of our microprocessing microscope is able to create predefined 3D geometries or to import 3D files in STL format, as in the well known rapid prototyping technique.